The idea of Archetypes does not necessarily describe a life path in its entirety. Instead our lives are comprised of a variety of archetypes of which we are many and are the many experiences and people that we interact with. When we talk about the idea of transcendence in the sense of an archetype it is not just about overcoming a specific list of attributes of that archetype but also of a resolution of that energy within our path. The way that I have been 'Downloading' information about Archetypes is by looking over my own life and found the essences of various themes in the relationships that I have had with myself, others around me and the personal perception of my experiences. I believe that we see our lives through the eyes of our experiences and that by resolving certain belief systems we move through transcending that paradigms that are associated with those experiences. I would like to start off by saying that there are no right or wrong archetypes. There isn't one that has transcended further or that is of a higher vibration. In truth, I believe we are all of these archetypes and that depending on the given stimulation in any particular experience the qualities of the archetype begin to come forward. Archetypes within our personality do not need validation from outside sources. They are all valid aspects of human consciousness and being within one archetype or another doesn't change the sacredness of the journey or the access of consciousness characteristics of any given persona. The reason that working with and understanding our personal archetypes can be useful is because it can lend insight into the way that we process our relationships in this life. The term 'Point of Reference' is also valid in this information. A point of reference can be seen as the map-work that has the potential to bring a particular archetype into conscious awareness within an individual. An example is: When X happens to me I begin to feel Y. Or, in other words, when a certain experience happens it will bring up the associated energy of other similar experiences from our path in the past. It is what has the potential to formulate our reactions. The concept of duality within the transcendence of a given archetype is important in understanding what I like to call the Void energy and the Filler energy. The Void energy can be seen as the disempowered aspect of a particular archetype. The Filler aspect isn't necessarily empowered but has the ability to make the Void energy have a sense of empowerment (often temporarily). For something to be within the concept of duality it has to be on a polar spectrum. The idea of something being dualistic means that it has two opposing forces. The idea of polarity is that these opposing forces have a magnetism. The process of resolution is never ending. We are constantly neutralizing energy within any aspect of our body, mind and spirit at any given time. Most likely we are resolving many energies in every second. It is the nature of our physical existence to both transmute energy and to integrate it. When we have two dualistic concepts happening in our lives (within us or around us in the form of an experience) the polar magnetism between the opposite forces naturally brings both archetypal personas into the same 'arena' so that resolution can happen. This resolution can take the form of subtle neutralization of the emotions associated with the archetypes or it can be a vast, and sometimes explosive, re-balancing. Either way we are here to learn in this universal university and all experiences are possible and even if they aren't 'welcomed' they may still happen for the purposes of resolution. Our world is comprised of many levels of consciousness operating at different frequencies. A certain frequency holds a specific range of emotions that are associated with it. A given frequency will effect a person or a mass of people who have energetic similarities in a specific way based on the points of reference for that individual or group. Points of reference is important here because exposure to the frequency that will produce a certain reaction in one individual or group may produce an entirely different reaction in an individual or group with a different set of reference points. For example: If one individual had a reference point that produces anxiety while driving due to a past car accident the stimulation of swerving in a car will create a frequency of energy within the persons energy field that is linked to anxiety or panic. Someone without that reference point will have no frequency change in their energy field. The same is true for masses of people. If an individual has a certain set of vibrational frequencies that they operate in within the 'normal limits' of their everyday lives they are naturally linked on some level with others operating in the same spectrum. The mass consciousness of that group would mean that under certain stimulus on a global level the spectrum of response would be similar among the individuals that create the group that the mass consciousness is connected to. When a global event happens the collective energy of that group of individuals would produce an energy pattern in the world that will either work towards resolution of the dualities from within the group for neutralization or will produce an 'interference pattern' which will attract a different mass consciousness to come into conceptual polarity for neutralization. For example: A group of people who experienced sexual abuse in their life at one point hears about a massive catastrophe such as human trafficking and it brings up the frequency range of stress. That group may not be able to resolve that energy among themselves because they are all too stressed or anxious to produce a calming frequency and the energy spirals out of control for that mass of people. At that time the energy of that mass begins to attract a separate archetypal energy to neutralize the interference pattern such as the archetype of The Healer. The resolution in this case may be that the initial, stressed mass becomes the archetype of The Wounded Healer in order to neutralize and transcend that energy on earth. The masses may seem separate or dualistic but their magnetism creates a harmony of movement within the world. This can be seen as a sacred dance of the cosmic energy where one harmonic beat inspires one mass to move a certain way which fits into the movement of a different mass. 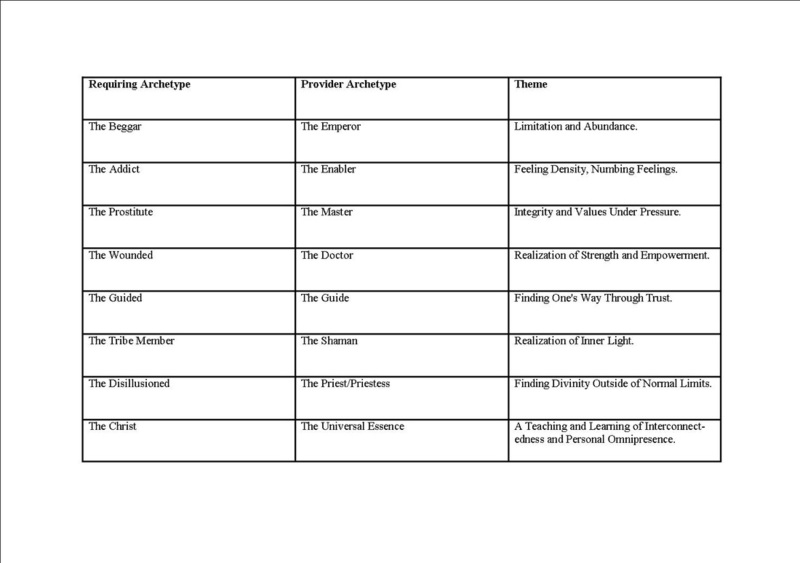 The following chart is a very short list of prevalent archetypes that are being processed on earth at this time. The Archetypes listed are in duality with one another in a paradoxical way. The themes are the polar magnetism that works to draw the aspects of duality into resolution. The archetypal energy has many different levels as it moves from a place of density to a vibration of light. There different levels can be seen as transient attributes. Because we are on a continuum in this universe when a person is vibrating at a certain archetypal affinity they will naturally have experiences, inspirations, ideas and realizations that will move from a low density energy field to a transcended energy. These Archetypes do not have 'Bad' or 'Negative' energy and like everything else they learn from their experiences in order to progressively move toward divine realization within themselves. As we progress through the various archetypal energies we can find divine realizations that will allow us to know that all of these emotions, reactions and reference points are ordained. When we think of the word ordained we often think of a priest or minister although in this sense ordination means that all of our experiences are appointed, led, inspired or created by divinity and are meant to have a profound effect on our path. The paradoxical effect here is that we can resolve or transcend the harder emotions or reactions of the archetypal persona because of the polar attraction of duality. In a sense when the need and the supply become one being that thing then has no need and no supply - it just exists as a homeostatic being. This is what we as individuals, a collective and a universe can work on. If we were all homeostatic density would not exist. Density is born out of conflicting, transient and heterogeneous energy. We all have times in our lives where things feel like they are moving too quickly and in the sense of Archetypes know that there is nothing that is not moving forwards. Grace is granted through the acceptance of one's condition and the trust in the divine to elevate one's consciousness. When we learn to exist as we are we the move forward to being that omnipresent energy within our own lives. Being all of the need, supply, cause, effect and resolve can bring us out of whatever we happen to be going through. The best example of transcendence is not necessarily trying to change the way we are, but instead to find love within our experiences and see our own divinity in all that we encounter. Remembering that no matter what is happening in your life, no matter how hard things are or what energy you are embracing know that YOU are THE GIFT.